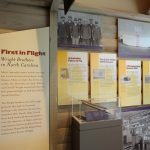 The North Carolina Museum of History debuted the new exhibit, The Wright Brothers, Dec. 17, 2016, in the permanent exhibit of North Carolina. 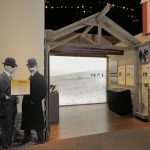 The exhibit tells the Wright North Carolina story of 1900-1903, 1908, and 1911, and the monument construction at Wright Brothers National Memorial. 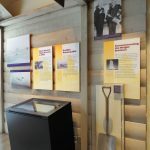 The National Park Service has loaned the museum airfoils and bicycle chains from the Wright machines flown at Kitty Hawk and the shovel used by Orville Wright in 1928 for the ground breaking of the monument. 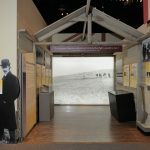 An interactive feature presents the Wright story through pictures, letters, drawings, and historical moments including famous well known images to several not seen in public format previously. 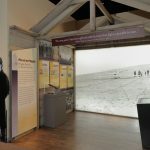 The exhibit compliments the 1903 Wright Flyer and the 1911 Glider on exhibit. Photos courtesy of The North Carolina Museum of History, photographer Eric Blevins.